With a clean light gray finish flowing over the classic Louis Phillippe styling, the Frisco bedroom collection flawlessly captures the essence of relaxed traditional design. 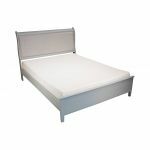 The ogee shaped top moulding and bracket feet along with the upholstered panel sleigh headboard with a textural gray-white fabric adorned with nail head detailing creates a beautiful bedroom collection you’ll be proud to own. 7 piece bedroom includes dresser, mirror, chest, night stand, queen headboard, footboard and storage rails. Mattress and foundation/box spring available, sold separately. Actual fabric, leather and finish colors may vary by monitor. With a clean light gray finish flowing over the classic Louis Phillippe styling, the Frisco dresser flawlessly captures the essence of relaxed traditional design. 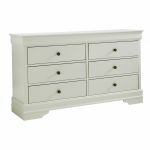 The ogee shaped top moulding and bracket feet creates a beautiful dresser you’ll be proud to own. 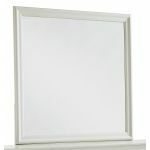 With a clean light gray finish, the Frisco mirror is the perfect addition to the dresser. With a clean light gray finish flowing over the classic Louis Phillippe styling, the Frisco chest flawlessly captures the essence of relaxed traditional design. 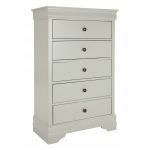 The ogee shaped top moulding and bracket feet creates a beautiful chest you’ll be proud to own. With a clean light gray finish flowing over the classic Louis Phillippe styling, the Frisco night stand flawlessly captures the essence of relaxed traditional design. 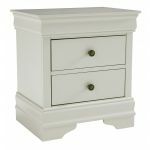 The ogee shaped top moulding and bracket feet creates a beautiful night stand you’ll be proud to own. With a clean light gray finish flowing over the classic Louis Phillippe styling, the Frisco bed flawlessly captures the essence of relaxed traditional design. The upholstered panel sleigh headboard with a textural gray-white fabric adorned with nail head detailing creates a beautiful bed you’ll be proud to own.